Approximately 50 years ago, a traffic ticket was issued and put on a car being operated by a member of the University of Scranton Class of 1965. The fellow came along as the ticket was being written and he tried to talk his way out of it. Other students passing by stopped to watch. A crowd partial to the plight of the student gathered and thing began to reel out of control. More police arrived and then a round-up of students started. Later in the afternoon, a local radio station reported that 18 arrests had been made. The chancellor of the Jesuit University went down to the local police station and by the time the local morning newspaper was delivered the next day, no arrests had been made and no incident had occurred. Unless someone had been there to see it happen, most Scrantonians would ever know about it. The incident was quickly forgotten and (mostly) disappeared from the annals of Scranton History. On October 1, 1965, a student at the University of California's Berkeley campus, Jack Weinberg, was proselytizing from a card table on Sproul Plaza about the Congress of Racial Equality (CORE). The topic was in direct conflict with school rules which expressly forbade political oriented activity on the campus where a scholarly atmosphere was traditional. Again, events spun out of control and eventually students surrounded the police car where the fellow who was being arrested was sitting. Someone urged the students to lie down all around the police car to deter the car from proceeding to the police department. A stand-off situation developed. One student, Mario Savio, in an attempt to defuse the volatile situation, jumped on top of the police car (he removed his shoes so that he wouldn't scuff the paint) and began to give a speech. That example of impulsive extemporaneous oratory became an iconic moment and would be recognized around the world as the start of the student activism era in the USA and Berkeley's Free Speech Movement (FSM). 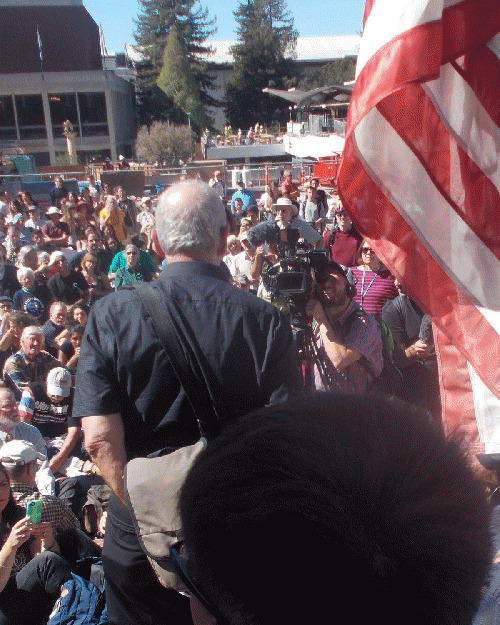 A rally to mark the fiftieth anniversary of the events which spawned the Free Speech Movement was held Wednesday, October 2, 2014, at the same location, Sproul Plaza, and drew a crowd of several hundred which included current students and (by a show of hands) a goodly number of individuals who had witnessed the original confrontation. It was a melodramatic moment for them when the voice of Mario Savio was replayed via electronic means. Cynics who appreciate heavy-handed audience manipulation couldn't help but notice that it would have reduced the older folks to tears if the event producers had played Jerry Lee Lewis' song "I wish I was 18 again." An assortment of journalists was on hand to record the new event for posterity. Local newspaper and radio news reporters were there as well as a platoon of photographers and at least two TV news crews. One of the reporters was representing the Paris publication Le Monde newspaper and the reporter, Cerine Lesnes, mentioned that she was new to the area. She had been reassigned to the Bay Area because that paper had just opened up a news bureau in San Francisco. Since newspapers have been cutting the use of satellite offices as a cost cutting measure, this bit of trade talk caused us to schedule a bit of subsequent fact checking to see if this is an anomaly or if it can be used to write a future trend-spotting column about a turnaround in the newspaper industry. Ironically the ceremony to mark the fiftieth anniversary of the start of the Free Speech Movement fell on the same day that the new issue (Vol. 49, No. 1) of the Bay Guardian carried the latest installment of Project Censored's annual list of the year's top ten underreported stories. Free Speech is about the unimpeded flow of information; contemporary Mainstream Media (MSM) is about corporate propaganda masquerading as news. Fifty years ago students clamored to have their voices heard on social issues, but in the interim, the main stream media in the United States has become a sad pathetic echo of what the citizens think they are getting; i.e. enough information to make well informed decisions in the voting booth. The irony of celebrating free speech while economic reality stifles dissent and student criticism in political issues seems to contradict the essence of what the day was meant to promote. Many Americans think that the valuable role played by newspapers has been supplanted by the Internets but reality contradicts the idea that "you can look it up on the Internets." There are times when the World's Laziest Journalist wants to check something we have written in the past and our attempts to find it online have been unsuccessful. Our opinion of the quality of the information available on the Internets keeps shrinking. Initial critical assessments of the Internets potential asserted that it would become just another sales tool for corporate America and that the promise of developing unique voices that could build an audience and clout was doomed to be vetoed by the corporate leaders who will be very reluctant to foster any means that would encourage and supply an opposing point of view.